Where did my folders go? How do I arrange my sent messages by the name of the recipient? 1. 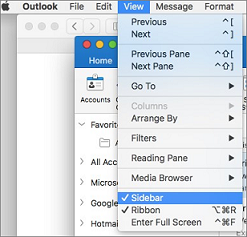 Open Outlook 2016 for Mac. 2. Select View > Sidebar. 1. 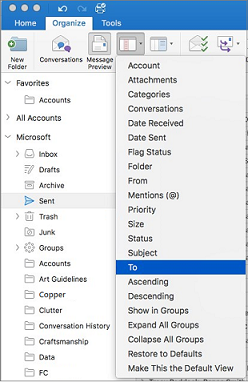 In the sidebar, choose the Sent folder. 2. Select Organize > Arrange By > To. Error code 3253 means that your connection to the email server failed or was dropped. You might need to update your version of Outlook. 1. In Outlook, click Help > Check For Updates. 2. If an update is found, download and install it. 4. If the problem continues, click Help > Contact Support. You might be offline. On the Tools tab, make sure the Online/Offline toggle switch is set to ON. If the problem continues, your message might have an attachment that's too large to send. See Email doesn't send. Why can't I see all my groups?